Even people who aren’t avid baseball fans (your DSN editor included) can get something out of this one. When two baseball teams play each other on two consecutive days, what is the probability that the winner of the first game will be the winner of the second game? DSN’s father-in-law told him that recently the Mets beat the Phillies 9 to 1, but the very next day, the Phillies beat the Mets 10 to 0. How could this be? If the Mets were so good as to win by 8 points, how could the exact same players be so bad as to lose by 10 points to the same opponents 24 hours later? Let’s call this situation (in which team A beats team B one one day, but team B beats team A the very next day) a “reversal”, and we’ll say the size of the reversal is the smaller of the two margins of victory. In the above example, the size of the reversal was 8. Using R (code provided below), DSN obtained statistics on all major league baseball games played between 1970 and 2009 and calculated how often each type of reversal occurs per 100,000 pairs of consecutive games. The result is in the the graph above. Big reversals are rare. A reversal of size 8 occurs in only 174 of 100,000 games; a size 12 reversal happens but 10 times per 100k. A size 13 reversal never happened in those 40 years. One might think this is because it would be uncommon for a team that is so good to suddenly become so bad and vice versa, but note that big margins of victory are rare: only 4% of games have margins of victory of 8 points or larger. If a team wins on one day, what’s the probability they’ll win against the same opponent when they play the very next day? We asked two colleagues knowledgeable in baseball and the mathematics of forecasting. The answers came in between 65% and 70%. The true answer: 51.3%, a little better than a coin toss. That’s right. When you win in baseball, there’s only a 51% chance you’ll win again in more or less identical circumstances. The careful reader might notice that the answer is visible in the already mentioned chart. The reversals of size 0, (meaning no reversal, meaning the same team won twice) occur 51,296 times per 100,000 pairs of consecutive games. What of the adage “the best predictor of future performance is past performance”? It seems less true than Sting’s observation “History will teach us nothing“. Let’s continue the investigation. One final note. The 51.3% chance you’ll win the second game given you’ve won the first is smaller than the so called “home team advantage”, which we found to be a win probability of 54.2% on first games and 53.8% on second games. 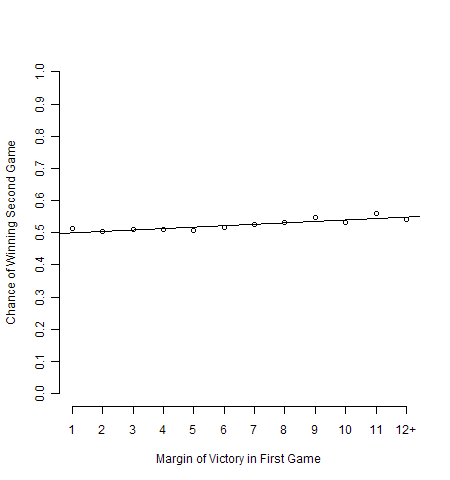 When the home team wins the first game, it wins the second game 54.7% of the time. 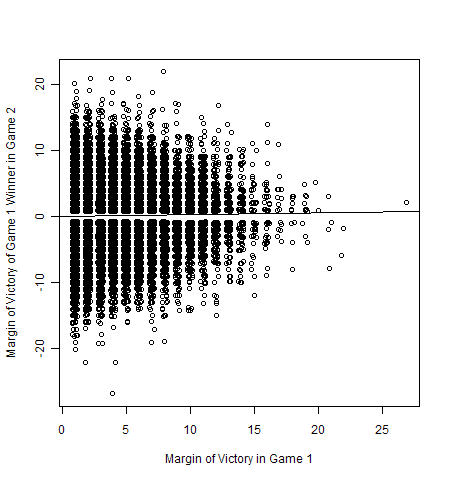 When the home team loses the first game, it wins the second game 52.8% of the time. When the visitor wins the first game, it wins the second game 47.2% of the time. When the visitor loses the first game, it wins the second game 45.3% of the time. Surprisingly, when it comes to winning the second game, it’s better to be the home team who just lost than the visitor who just won. So much for drawing conclusions from winning. Decision Science News has always wondered why teams are so eager to fire their coaches after they lose a few big games. Don’t they realize that their desired state of having won those same few big games would have been mostly due to luck? There you have it. Either we have made an egregious error in calculation or recent victories are surprisingly uninformative. This may be of interest for people who don’t use R or for impatient types who just want to cut to the chase. No guarantee that our pre-processing is correct. It should be all pairs of consecutive games between the same two teams. #named "gl1970_79", "gl1980_89", etc, reachable from your working directory. Except for the fact that it isn’t “more or less identical circumstances” because the starting pitchers change, which makes a huge difference. If the home team has their all-star pitcher in the first game and the 4th or 5th best pitcher starting the second game they would be expected to do better in the first game and worse in the second. Ed – thanks for the jitter tip! Scott – good point. Since pitchers tire out it’s not quite the same team on the second go. I think Scott makes a good point… a ‘good’ pitcher can’t pitch two games in a row. I wonder if you do some sort of ACF plot, you would see a spike everytime the ‘good’ pitcher rotated back around. I would also argue against the point about virtually identical circumstances because of the fact that pitchers are so important. This is evident in the baseball betting lines where the pitching matchup is by far the biggest factor. I would be interested in seeing a similar analysis in other sports, although it may not translate well since baseball is the only sport I can think of where you have a series of games in the same location. It happens in the playoffs in hockey and basketball but by that time you are probably talking about fairly evenly matched teams so you may see similar results. For instance, the Blackhawks last game one to Vancouver 5-1 and won game two 4-2. The large reversal there can probably be attributed to taking excess risk to create offensive opportunities to comeback from a deficit at the expense of giving up some odd man breaks. Ed – I added the jitter code and the new graph. Thanks! MacDaddy – I too would like to see this in other sports. You miss out on the similarity of the two games, but that variation can probably be made up for with the large amount of sports data available. I’m guessing that other sports may hold surprises as well. It could be, but we’d need to check whether the rarity of hockey reversals of that magnitude could be due to chance alone. Good points by all. If we could somehow weight these results based on the starting pitchers (perhaps using Fielder Independent Pitching adjusted for park factors…xFIP) you might be able to normalize the data a bit more. There will be substitutions from one day to the next which might impact offense/defense but that shouldn’t be an issue with such a large data set. This is interesting but overlooks the huge difference the starting pitcher makes. In the first game, the Phillies had Kyle Kendrick http://www.baseball-reference.com/players/k/kendrky01.shtml who is an average pitcher. Perhaps you could analyze how the Phillies do against the mets with Halladay and Kendrick separately. If you have only a cursory knowledge of baseball, you know that the very best teams each year only win about 60% of their games. The worst teams still win about 40%. In fact, incredibly bad, historically bad, teams, still win 30% of their games. Just taking the outer boundaries, we can say that in a two game series, the good team will win both 36% of the time, and the bad team will win both 16% of the time, with the same team winning both games 52% of the time. And we’d probably expect the reality to be a bit lower, since most games are between fairly evenly matched teams (where the figure would be 50%). I assume that the question was not posed very accurately to the colleagues. If the question was, when a team wins a game, how often do they win the subsequent identical game, then the responses make more sense (common sense dictates that teams still only win 2/3 or so of the rematches). But the analysis itself does not in fact select identical games, it selects consecutive games with different pitchers. Basically, it doesn’t isolate a unique scenario at all, the numbers generated are simply the obvious results given the range of winning percentages among major league teams. Without any data analysis, you can predict that the percentage must be between 50 and 52%. And the graph comparing margin of victory, seems to simply be identical to the graph of run differential in any sample of games. Past performance is in fact a pretty good indicator in this instance of future performance, but there is a ton of information you could analyze to accurately assess a team’s past performance. Whether the team won or not the previous day is a very poor measure. It would be like going to the race track, opening up the daily racing form to look at the past performances, and the form simply telling you what place the horse finished in it’s last race. Ha! Actually, the result you saw, 48.7% reversals, suggests a strong skill factor. Imagine a coin that comes up heads with probability 0.5806. That’s a 38% advantage (.58/.42) in skill. If you flip the coin twice, you’ll get a 50/50 split 48.7% of the time (2*.5806*.4194=0.487). Isn’t the binomial distribution amazing? You won, but how much was luck and how much was skill? was written on May 5, 2010 and filed in Encyclopedia,Ideas,R,Research News,SJDM. There are 13 comments so far, feel free to post a comment of your own.